One thing that I really like, is when a restaurant does away with the typical place setting and changes it up to add their own signature look. 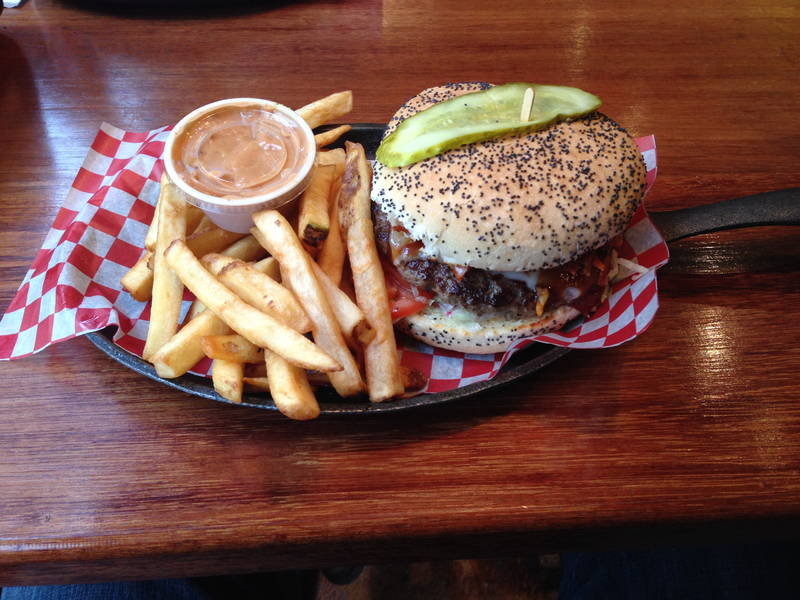 My burger was served on skillet, and it added a small but unique twist on the presentation. I really liked the look that the poppyseed bun gave to the burger, and the signature hand-chopped relish was something that really caught my eye. The one thing I was worried about when I saw this burger was the size. I wasn’t sure if it was big enough to satisfy my hunger, but that thought definitely changed throughout the meal. With the first bite, there was one thing that stood out right away. The house-made roasted garlic mayo. This mayo was so delicious and flavourful that I couldn’t get enough of it. I also really liked how it mixed in with the hand-chopped relish, and it really created a nice taste in my mouth. As for the burger patty, it was good but I would have liked for a bit more seasoning to add an extra kick of flavour to go along with the mayo/relish combo. 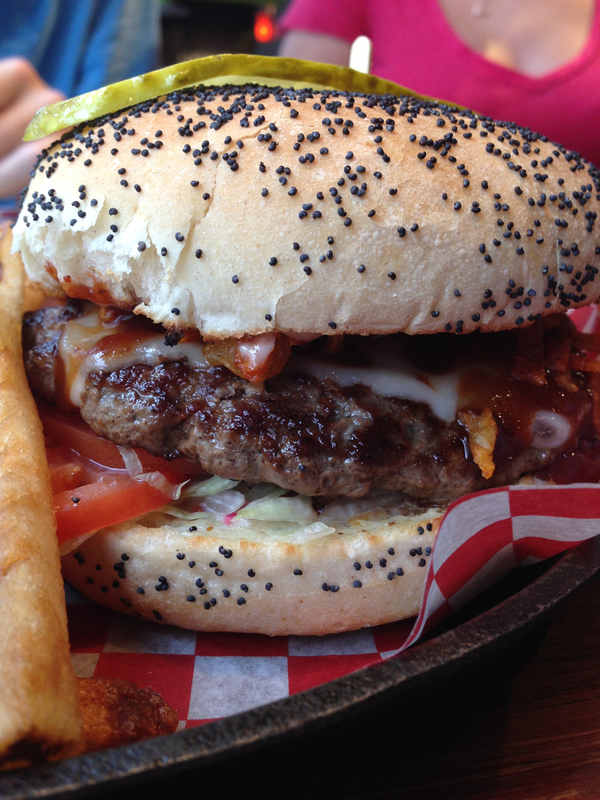 Having had whisky creek BBQ sauce previously at another restaurant, I was already a fan of it, and I was really glad to see that they didn’t overdo it in terms of the amount that they put on the burger. For my fries, I got the smokey BBQ mayo dip, and while a mayo based dip isn’t exactly a healthy choice, it is a very delicious one. I really liked the interior of this place as it was very modern and it allowed you to see the burgers being created almost right in front of you. There didn’t appear to be a whole lot of seating, so this could be an issue during busier times, but it wasn’t an issue for us when we went. The staff all seemed pretty friendly and it appeared as though they enjoyed their jobs. The guy who took our orders even came over at one point and asked us how our meal was, and when we gave our praise, he seemed genuinely thankful that we enjoyed ourselves. It was this small reaction that really makes me appreciate a place like this, because it is very apparent that the staff wants to give you a great experience. The price for this burger is $9.26. This price gets you just the burger, so after I made mine a combo (bottle of pop and fries), got the dip for my fries, and taxes, I ended up paying around $17. This price is kind of on the higher range, but this is an after tax price so when you think about it, it is in the somewhat typical range for a burger, fries, and drink. That being said, I would have liked the burger to be a bit more full of toppings. It was nice though to eat a burger that filled me up to the point where I was comfortable, and not feeling somewhat uneasy because I just ate way too much. I’m definitely going to be returning to Relish to try one of their other creations. They also have a different featured burger each week, which makes me really excited to see some of the things they will come up with. This place can be kind of pricey after all the add-ons and whatnot, but I would say you should check it out, as it was a pretty delicious meal.